Cheshire West and Chester Council and Cheshire West Voluntary Action (CWVA) have teamed up to develop an on-line Reward and Recognition Toolkit to help community groups and charities thank their volunteers. The free toolkit includes a range of downloads including thank you letters, certificates, e-birthday cards and press release templates. All there to help groups and charities 'Love their volunteers'. An inspirational Volunteering Song is also included in the toolkit. The production of this special song began at the Love to Give Volunteer Celebration - hosted by Cheshire West and Chester Council in 2018. Volunteers, during a workshop, began shaping the song, which was then completed by Claire Mooney using words taken from Cheshire West Voluntary Action's Annual Awards entries. The Council's Cabinet Member for Communities and Wellbeing, Councillor Louise Gittins, said: "Volunteers are worth their weight in gold, sharing their time and skills to support individuals, groups and the wider community - in fact many services in the borough could not operate without them. 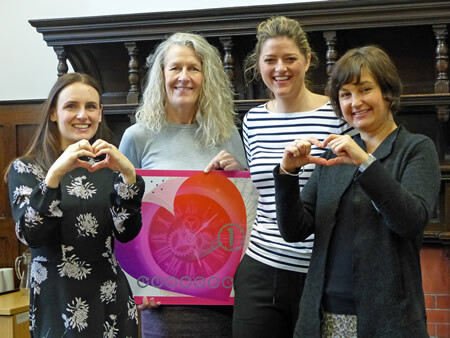 "Valentine's Day is the perfect day to take a look at our Reward and Recognition toolkit and think about how you can use it to continue to inspire and recognise the volunteers who support your group or charity. "We have worked with CWVA to help make sure that volunteers feel appreciated all year round for donating their time and skills. Retaining happy volunteers and making sure that they feel really appreciated, helps community groups and charities flourish." Helen White, Chief Executive for CWVA, added: "Volunteers are the life blood of our communities and this toolkit will ensure that volunteers know how much they are valued and appreciated. "I have already received lots of positive feedback about the toolkit from local groups who have helped us to pilot it. Please take a look at it, everything is free and you can pick and choose which downloads suit your needs."